Bluetooth and mobile app provides control remotely from your smartphone. Includes convenient, sturdy, mobile caddy cart for easy storage. Programmable daily cleaning schedules with a built-in weekly timer. Cleans fiberglass, vinyl, granite, pebble and tile pool floors, stairs and walls. Fast and easy debris removal with a top access filtration basket. Select from large or fine debris filtration cartridges. Plug-in convenience requires no installation, booster pump or hoses. Vacuums all types of debris and helps remove algae. Designed to scrub, vacuum, and filter (including the waterline) your inground pool. Includes 60ft floating cable and power supply. ntegrated filter reduces run time of your primary filtration system, saving on pump energy costs and minimizing wear and tear. The Prowler 930 robotic pool vacuum cleaner is designed to scrub, vacuum, and filter (including the waterline) your inground pool. Paired with Bluetooth wireless technology, its deep-scrubbing action delivers ultimate cleaning performance and convenience. Plus, the Prowler 930 works independently from the poolâs filtration system. With no added booster pump to run, youâll enjoy the most cost-efficient, eco-friendly cleaning ever. Your Pentair 930 also includes the convenience of a sturdy, mobile caddy cart for storage. Get the ultimate control and convenience with Bluetooth technology. From Pentair’s “Prowler 930” mobile app, you can operate the robotic pool vacuum from the convenience of your smartphone. And, for quick spot cleanups prior to social gatherings, you can manually âdriveâ the cleaner to areas of concentrated debris for fast removal. 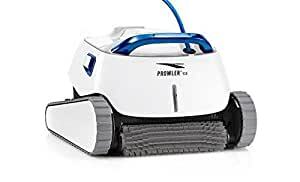 Prowler 930 automatic pool cleaner comes with separate mesh baskets made for either large or fine debris, so you can customize the filtration level or do a lightning-fast swap out during pre-party touchups. This robotic in ground pool cleaner is completely self-contained. Its low voltage operation and internal filtration system saves on high energy costs while reducing wear and tear on your pool’s filtration system in an efficient three hour cleaning cycle. Just plug it in and watch it go to work. Itâs built to minimize effort, so you can spend more time enjoying your pool instead of cleaning it! Cleans pool sizes of up to 30′ X 60′.